This restaurant, located in an old movie theater, opened with a big bang seven years ago. Close to the Champs Elys�es, Man Ray caters to the cream of Paris� in crowd. Johnny Depp, John Malkovich, Sean Penn, and Mick Hucknall (Simply Red) are all partners in the business. 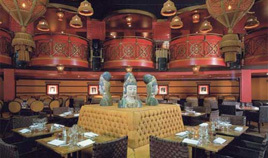 The d�cor is pseudo-nouveau-Asian meets bordello deco, and everything is done on the grand scale. Le Man Ray is open seven days a week with a bar open every night until 2 AM -except Friday when it is open �until dawn. In the early evenings you can hear live jazz. Fridays from half past midnight on, a DJ plays fine music. The menu leans in the Asian direction as well, including sushi and wok works. The dining room is huge and bustling, the d�cor is very grand, the people are beautiful, the music is great, the drinks are expensive� if that is your cup of tea then you�re bound to enjoy Man Ray�s electric atmosphere, crowd, and ambiance.